DCU alumni Céire Smith has been selected for the Ireland team in the AIBA World Women’s Elite Championships. The flyweight flew out to New Delhi on the 11th with the prelims beginning on the 15th. Smith, who has just graduated from DCU, has been boxing since the age of 15. She began in Cavan boxing club training under Brian McKeown, who she remains with to this day. She competed in her first world championship in 2010 at the age of 17. Smith missed out on London in 2012 but decided that she would pursue a college education. She started studying Sport Science and Health in DCU while continuing to train full time. The unfortunate run took a bit of a toll on Smith and she decided that it was time for a break. “I had missed out on so many split decisions that I just needed a break to clear my head,” Smith told The College View. Following on from there, she completed her placement in Australia thinking her boxing days were over but the draw towards the club was too strong and the passion reemerged. Smith became the captain of the squad at this point and realised that she had unfinished business. With the knowledge that she couldn’t train as hard as she would like, with final year study taking up a lot of her time, she had to decide if entering nationals would be a good idea. While it was a tough decision she decided to consult with her coach before committing. She decided to compete in this and then take a step back so she could prioritise her studies for a while. Smith went on to win the final 5-0 against Niamh Early and continued with her final year in DCU. Once her final exams were complete she thought it was best to return to boxing while being able to fully commit. 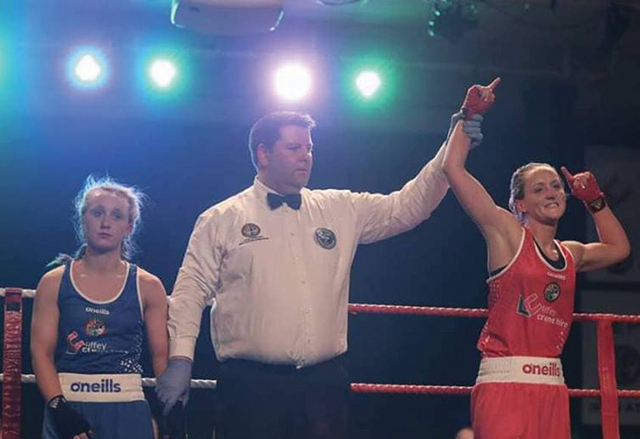 Smith represented DCU in the nationals this year and said she was delighted to deliver the first elite senior title to DCU Boxing Club. Smith is grateful for the sports development team in DCU saying they were extremely helpful in her final year.